My $2,550 Routine Doctor Exam - WTF?!? Home / Finance / My $2,550 Routine Doctor Exam – WTF?!? My $2,550 Routine Doctor Exam – WTF?!? April 27, 2009 By John P.
Folks, a few weeks ago I went to the doctor to get a physical. Nothing special whatsoever. Just a routine annual physical. It was a two part visit. The first time I went they took blood to run the normal tests (I’m healthy). Then I went a few days later to see the doctor and get checked out. 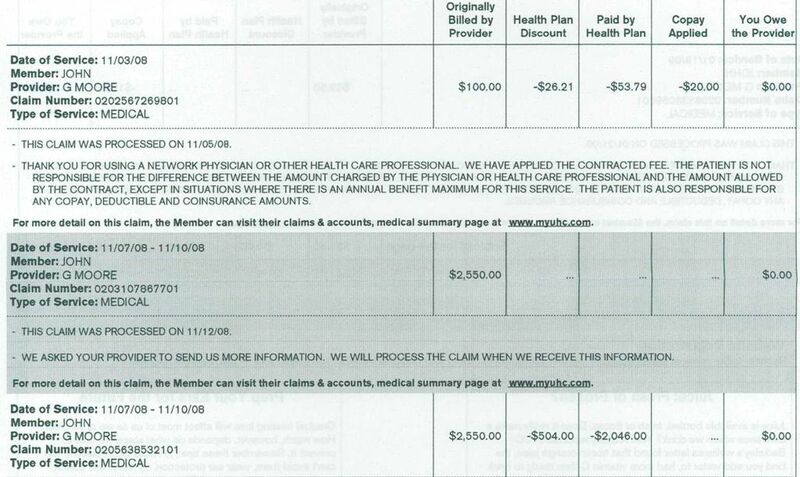 So, I leave the office and a couple weeks later I get some paperwork from my insurance company informing me that the doctor has billed them $2,550.00 for the visit, and they were paying $2,046.00 after the healthplan discount. What the FXXK?!? I’m not kidding when I tell you that the doctor visit was less than 30 minutes. Probably 20 minutes of examination and discussion of the blood test results – which were fine so not much to discuss. So I’m trying to figure out what the hell these OUTRAGEOUS charges are for? I mean, normally we just pay our $20 copay (or whatever) and go on our merry way, but if you wonder why the hell insurance keeps skyrocketing, it’s because the doctors are literally charging $5,000 per hour for blood work and consultation. I’m so angry about this, it makes me distrust the entire medical community. This was not f-ing spinal surgery. The guy looked in my ears, squeezed my stomach, and sent me on my way. It’s got to be one of the biggest shams in the history of all damn time. Has this happened to anyone else? And why isn’t everyone outraged? I just called my insurance company and he said it is my fault because I should call my insurance before my routine checkup! He doesn’t care about my problem because I had to pay for it! I went in for a routine exam and blood work. I talked to the doctor for no more than 8 minutes. The only “exam” was looking in my ears. He asked questions and I answered. They billed the insurance company for $1,155 which included TWO office visits – one was the “routine” my insurance covers and the second was because something I said when I answered those questions was considered not routine and they billed an entire second office visit for it. I’m careful not to discuss any problem when I go in for a routine exam because I know this trick. I don’t know how answering THEIR questions can result in a second office visit charge. I have a High Deductible Health Plan and everything above that “routine” exam comes out of my pocket until I meet my $3,000 deductible. From now on I’m going to answer the doctor with… “Will answering that question cost me extra?” every time he asks something. Maybe they’ll get tired of hearing it. Doctors work for corporations that own them all now. They don’t care about people and there is no regulation to protect patients rights. They can do whatever they want to do. I had a similar problem. I went to my family doctor for a routine check up (at that time I was not sick or had any physical problem, just need a blood check). And what he did is doing my lab test for cholesterol and blood sugar. I supposed to get a free visit bc BlueCross Blue Shield of GA – my insurance company promises that I can have the first annual exam for free. But then the doctor didnt file the visit as a routine check up, so the insurance company refuses to pay the charge. Even though the doctor didnt charge that much amount as your for the visit but I’m still angry that the doctor refused to change his filing for me to get it free. He said that I visited him not for a routine check up (may be because 2 years ago I visited him to check for blood sugar, and it turned out that I’m in the border line to be diabetic, but i’m still not a diabetic, and that is why i need the preventative care). And I still dont understand why because it is clear that what he did is just checking my blood sugar and cholesterol – that is just a little bit higher than usual. But i decided not to visit him any more and if he refuses to change his filing then he cannot get the money from me. Doctors, they can help you back to your health. I think this recession has gone to people’s heads. It could be the economy for the charges being so high. If you have the best insurance around then you might get hit worse. As for me I never get into such fault. Because simply I never go to doctors. This year I was almost dead, 3 days spent in bed without sleeping, hardly breathing air and 24/24 I was drinking my saliva. Then I was OK. Not a question of money I am an engineer and have what I need, but because I hate doctors. Doctors should work for free, they should be paid by the gouvernment, they should not work private. My opinion is folstered by the fact that I notice that evry one who goes to the doctor then he becomes sicker, he becomes frequent to the doctor, get sick frequenlty, is vulnerable psychologically too. I have faith that if the body is able to recover from any disease by itself, it’s just a matter of patience when we get sick. when we get medicines from persons known as doctors these medicines will worsen the situation, and even if they kill the disease then they disturb the body’s process of recovering and they affect it in the future processes. Don’t go to doctors. I think you should go to the judge to get your money back. This is unexpectable and if you let it go then you will be affected by the “doctor effect” which is a psychlogical disease such that person begin to justify the money they lost at the doctors. Greg Lewis above doesnt get it! It is not about the copay but it is about what the doctor is charging. That’s nuts for a just a routine physical. That’s more like an emergency room visit. Wonder what the detailed charges look like. Don’t worry, the free market will solve this for you. Oh wait, it’s the free market that got you here in the first place. Basically doctors take the money from insurance and not from you. The bill us really outrageous. What was the doc thinking? You should have asked him , $2500 for what? I’m not sure why you are complaining. Not like you got stuck with the bill. No offense but this is as much the fault of the insurance companies as the doctors and our health care system. The insurance companies set limits on how much they pay. Once doctors figure this out, they maximize their $$$ by making sure their charges get the maximum out of the insurance companies and then just drop the rest. As time goes by everyone just ends up paying more and why not? If doctors don’t charge, then the insurance companies just sit on that money and never use it. A perfect example is what some counties/states/cities are doing to make pay for EMS. Long are gone the days of free EMS in a lot of places. Now that counties have figured out this sham, they are doing the same thing. They don’t actually want to charge you for the ride/treatment especially since a lot of them have some guarantee of free or cheap ems, but with prices of everything going up, they can’t afford not to. Instead of charging people, they charge the insurance companies to get the $$$ from them, then drop anything over so it is still a ‘free’ ride for residents. After all, taxes aren’t paying enough to cover the free services and people aren’t donating like they used to so they need to get the money somewhere. Insurance companies are an easy target, especially considering that they put money aside to cover ambulance rides and if no one ever charges against it, they just pocket the money. Its all one big sham with everyone but the consumer profiting. It’s much. In Romania, a routine exam is about 300 euros. Anyway, I heard that the US health system is not good, but how are the insurance companies? They don’t pay for this stuff? You’re just now distrusting the medical community? My Grandfather went into a coma the ICU at Medical City in Dallas. After 4 weeks of different Doctors arguing and trying different treatments, we FORCED the HMO to stick to one doctor, within a week he was out of the coma, and another week he was home. Funny how after all these tests were run, all this money charged to insurance we said “no more” and he was fine. Billing at hospitals/dr offices is a real problem. We received a bill for my boy’s birth of around 15k, and we are only supposed to pay 500. After 20 phone calls to blue cross and the hospital they figured out the problem and we owed nothing more than the 500 we had payed 4 months earlier. call you provider and have them research what you should pay…then you’ll know. Do not pay the bill until you find out. Yup, happened to me John, 4156.34 for the dr to feel the lump on my stomach and tell me I had a hernia, took about 2 minutes, and then he made me come back to discuss surgery at another appt. Luckily I am on the lovely “copay” plan, so, I didn’t have to pay it, but yes, that’s right, its horrible! I think it’s just you. When I visit my doctor, the usual bill to insurance is around $250, which itself is heavily discounted before I pay my 20% chuck (around $30).